Welcome to Snapshot Saturday hosted by Melinda at West Metro Mommy. When you’re finished here, please be sure to check out the other terrific photographers who join in each week. So many wonderful photos and don’t forget to leave some comments! There were a lot of things that happened this week, some that came with photos, some that did not. Wednesday, Ralph and I attended the high school graduation of our grandson, Patrick. I’m saving the actual graduation pictures for the moment. After all of the terrible rains that we’ve been having, we were blessed with a beautiful night. 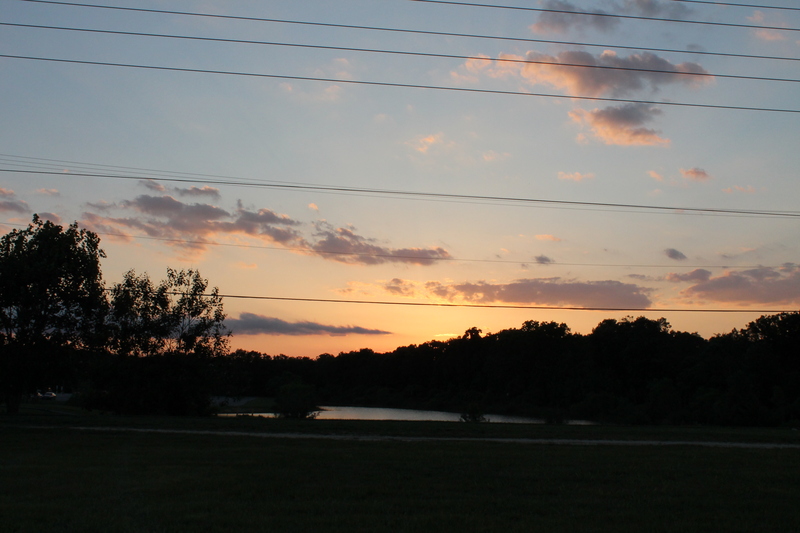 I was able to catch my first sunset with my new camera. This was a spot on the high school campus with a little pond. I thought it was beautiful! I couldn’t wait to share it with everyone. Be sure to stop by West Metro Mommy to check out all of the other wonderful photos that you’ll find there. This entry was posted in Uncategorized and tagged photography, Snapshot Saturday. Bookmark the permalink. Hi Fran, what a great shot of the sky – lovely. Thanks, Diane! I thought it was so pretty! Thanks, Dannii!! Great to hear from you again! Thanks, Laurel, we’re really proud of him. He goes into the Army the beginning of August. Have a great day! How exciting, a new camera! And a lovely sunset too. Thanks, Leslie! I’m loving the camera and Sunsets are my favorites second only to Sunrises! 😉 Thanks for stopping and have a great day! Thanks, Katy! Enjoy your Sunday! Glad you like it, Brona. I’m a little behind, I’ll go check yours out right now! Have a wonderful day! Beautiful sky and love the pond too! It just struck me as we left the football field. Thanks, Vicki!! It is a beautiful spot. Thanks. Thanks, Liz!! Have a great Sunday! Have a great Sunday Fran! So excited for you, Ameena! Moving is Such a joy… 😦 Hope it goes smoothly! So great to hear from you, Eleanor. I love this link up. So many beautiful photos. Take care! !